Girls can play sports too! Known as Attack No. 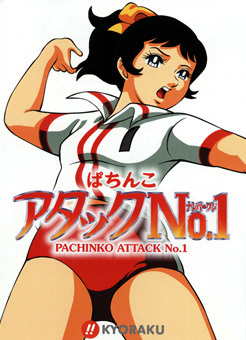 1 (アタックNo.1, Atakku Nanbā Wan), the first televised female sports anime. The manga was written by Chikako Urano in 1968, and the anime began in late 1969 and ran through 1971. First mean to capitalize on the success of the 1964 Olympic volleyball team, it ended up bringing more mature fans to the shoujo demographic, compared to Sally the Witch's success in that time. Kozue Ayuhara is the heroine, who transfers to Fujimi college and impresses the volleyball coach when she tries out. After making friends and enemies, the story highlights her struggles and triumphs as she matures and tries her hardest to become the best volleyball player in the school, Japan and the world. It inspired the series Attacker You! and Attack on Tomorrow, made several years later by a different animation studio but featuring several of the same staff. Even in 2006, it still ranked #9 out of 100 in the list of celebrities' favorite anime. It has a great number of fans in Europe, particularly in Germany, where it was shown as Mila Superstar (with Kozue being renamed Mila), Italy as Mimì e la nazionale di pallavolo (with Kozue renamed Mimì) and Spain as La panda de Julia (again, with Kozue renamed Julia). In 2005 a live-action drama was made based on the series. Clean Dub Name: In the German dub, main protagonist Kozue Ayuhara was renamed Mila Ayuhara. The reason is obvious, as her original first name sounded very much like "Kotze", which is a vulgar German term for vomit. Dolled-Up Installment: In the Italian version, the completely unrelated Attacker You! was turned into a spin off of Attack No. 1 by turning the main character into a cousin of Kozue, who inspires her to take up volleyball. Gratuitous English: ATTAKU, ATTAKU, NANBA WAN!! Hair Decorations: The easiest way to distinguish which girl is which is by their headbands or bows. Kozue has a big yellow bow, for example. Passionate Sports Girl: Kozue is the second Trope Codifier in anime and manga, with only Hiromi from Aim for the Ace! surpassing her. Romantic Two-Girl Friendship: Midori and Kozue. Midori first is jealous of her, but they soon grow to be extremely close. School Sport Uniform: The shirt-and-bloomers version is used by just about all the girls who play the sport. Serious Business: The sport! It's so serious she couldn't leave one game to visit her dying boyfriend in the hospital. Soundtrack Dissonance: The German opening has a cheerful and upbeat theme tune while featuring Kozue getting violently hit by the ball multiple times, falling to the ground, and being driven to tears. In fact, the theme melody doesn't fit this dramatic series at all and it was previously used in other countries for a much more lighthearted anime, Attacker You! (see here ), which was never released in Germany. To Be a Master: As per usual in 70's anime, the No. 1 tracksuit is coveted by all on the team. Training from Hell: As was popular in most early sports anime. The opening even shows her getting hit by the ball a few times.